You may not enjoy this book if you've been happy with how the U.S. Federal Government has been operating over the past 7+ years. Book Summary: Engineer and pilot Dave Henson and his team of high tech entrepreneurs transplanted themselves three years ago from Silicon Valley to McCall, Idaho to start NSurv Inc., a nanotechnology surveillance company. Having personally experienced the economic collapse of the country, Dave and his team are intent on reversing the current political and economic direction of the country. Ultimately they plan to bring a new level of transparency between the federal government and the public. 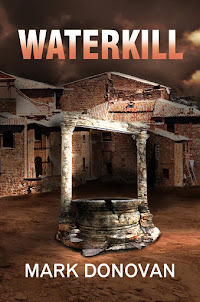 After 34 reviews on Amazon, Waterkill has an excellent ranking of 4.6 stars. 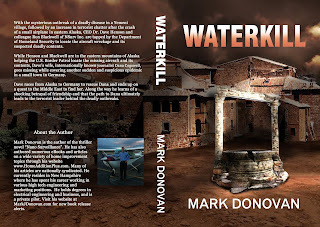 See Waterkill on Amazon here. In addition, all but one of the reviews have been very positive. For some reason one reviewer seemed to have an ax to grind with the book. But oh well, to each his/her own. The reviews and rankings have also been similarly as good on Goodreads.com and Barnes and Noble, with 4.47 and 5.0 rankings on 19 votes and 4 votes, respectively. Below is a typical review. Sales, however, have not been so robust. But at least they've been steady with some sales each day. Somehow I need to change the sales metric though. Very frustrating to have a plethora of excellent reviews, but limited sales. If anyone reading this blog post has any constructive advice, I'm all ears. For those of you who have been thinking about reading Waterkill, I urge you to give it a try. At $0.99 in Kindle and Nook eBook format you can't go wrong. Besides a fun read, you'll also find this technothriller enlightening. Waterkill tells a story of a very real threat to western civilization by middle eastern terrorists. More specifically the threat of religious cult terrorists introducing biological weapons of mass destruction to western cities and towns across Europe and the United States. Waterkill Book Summary: A Yemenis man tragically loses his wife and daughter, a small plane disappears into the Alaskan bush carrying a deadly secret, and thousands suddenly die in a small German town. American business magnate and high tech entrepreneur Dave Henson is tapped by the U.S. government to help solve the related mysteries, but quickly finds himself drawn in deeper and his timeline shortened when his wife suddenly goes missing. My first book titled NANO SURVEILLANCE will be on sale for free in kindle format on 2/7/16 and 2/8/16. See http://www.amazon.com/dp/B00DJSZ92O to download your free kindle copy. I originally released NANO SURVEILLANCE in June, 2013. However, I am now re-releasing it after it recently went through a comprehensive copy editing session to address some grammatical issues mentioned by some early book reviewers. So if you are interested in a technothriller, I highly suggest you take advantage of the two day FREE sale of NANO SURVEILLANCE. You can download a copy of the book at: http://www.amazon.com/dp/B00DJSZ92O. With the country on the brink of financial collapse, billionaire and high tech entrepreneur Dave Henson breaks an old personal oath to himself to remain apolitical as he attempts a daring and dangerous mission to save the country. Dave, along with a small group of engineers at his company NSurv, and his old friend and news reporter Dana Cogswell, decide to use NSurv’s bio-nano sensor technology to bring a whole new level of transparency between the federal government and the public. In the process they discover and reveal a sinister plot by the President and his administration to secretly drain and transfer the country's wealth and power to foreign entities. While Dave and his team covertly work to change the country’s political and economic direction by exposing the corruption in Washington D.C., the President announces his new plans to end global climate change and restore the country's economy. However the President's plans run sinisterly deeper, and include the required use of personal tracking sensors to be installed in every automobile and product sold in the country. If the President's plans become law, Dave is convinced it will destroy the country and provide the government with unfettered surveillance of the public. Dave’s team quickly finds itself intertwined in a deadly war with the President and his allies. 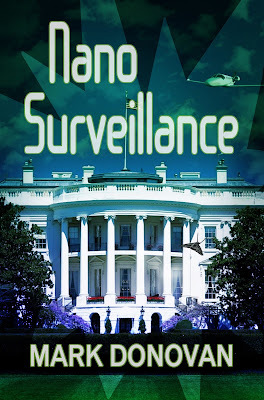 As the NSurv team works to capture and report the ultimate story to topple the administration and save the country, the President and his allies stop at nothing to protect their self interests and to capture NSurv's new surveillance technology. Risking life and limb, and a rekindled relationship with Dana, Dave remains undeterred while he leads his team forward in accomplishing their mission. Mentally torn, Dave inevitably has to ask the most from Dana. His request, and her decision on how much to sacrifice of herself, tests their new found relationship and holds the key to their ultimate success. I've just re-released my first book NANO SURVEILLANCE, an Orwellian #technothriller. Get it today for just $0.99. See - http://www.amazon.com/dp/B00DJSZ92O. The book underwent an extensive re-write and edit session over the past month. 5 Stars Review - By Robin Lee : Top 500 Reviewer - "This story goes way beyond our days of "Big Brother" is watching..Good character development and two story plot lines that seamlessly intertwine." Book Synopsis With the country on the brink of financial collapse, billionaire and high tech entrepreneur Dave Henson breaks an old personal oath to himself to remain apolitical as he attempts a daring and dangerous mission to save the country. Dave, along with a small group of engineers at his company NSurv, and his old friend and news reporter Dana Cogswell, decide to use NSurv’s bio-nano sensor technology to bring a whole new level of transparency between the federal government and the public. In the process they discover and reveal a sinister plot by the President and his administration to secretly drain and transfer the country's wealth and power to foreign entities. While Dave and his team covertly work to change the country’s political and economic direction by exposing the corruption in Washington D.C., the President announces his new plans to end global climate change and restore the country's economy. However the President's plans run sinisterly deeper, and include the required use of personal tracking sensors to be installed in every automobile and product sold in the country. If the President's plans become law, Dave is convinced it will destroy the country and provide the government with unfettered surveillance of the public. Dave’s team quickly finds itself intertwined in a deadly war with the President and his allies. As the NSurv team works to capture and report the ultimate story to topple the administration and save the country, the President and his allies stop at nothing to protect their self interests and to capture NSurv's new surveillance technology. Risking life and limb, and a rekindled relationship with Dana, Dave remains undeterred while he leads his team forward in accomplishing their mission. Mentally torn, Dave inevitably has to ask the most from Dana. His request, and her decision on how much to sacrifice of herself, tests their new found relationship and holds the key to their ultimate success. "﻿This is a heart pounding thriller that you don’t want to miss," says Pretty Little Book Reviews. "Everything in this book is utterly captivating and terrifying. Moreover, it is believable. Readers can connect with the characters and feel both pity and pure rage. So, if you’re looking for something new then I recommend trying this book out." See the entire review here. With the mysterious outbreak of a deadly disease in a Yemeni village, followed by an increase in terrorist chatter after the crash of a small airplane in eastern Alaska, CEO Dr. Dave Henson and colleague Ron Blackwell of NSurv Inc. are tapped by the Department of Homeland Security to locate the aircraft wreckage and its suspected deadly contents. While Henson and Blackwell are in the eastern mountains of Alaska helping the U.S. Border Patrol locate the missing aircraft and its contents, Dave’s wife, internationally known journalist Dana Cogswell, goes missing while covering another sudden and suspicious epidemic in a small town in Germany. Dave races from Alaska to Germany to rescue Dana and ends up on a quest to the Middle East to find her. Along the way he learns of a shocking betrayal of friendship and that the path to Dana ultimately leads to the terrorist leader behind the deadly outbreaks.